Can NC Profit from Shale Gas without producing it? In the midst of the debate in this state on whether shale gas production is worth the environmental risk we posit a different notion. We suggest that the state could create jobs and economic growth whether or not the gas was produced in state. This proposition was discussed at the Breakfast Forum on February 16. There are two underlying assumptions to this thesis. One is that if shale gas continues to be produced in the Marcellus and Utica, we can expect copious quantities in neighboring states. We can also expect prices to stay low for decades as modeled recently by Amy Jaffe and colleagues. The second assumption hinges on the low price of gas. If it stays really low as it is today, most of the shale gas production will be in the “wet” regions. These are reservoirs with a high component of natural gas liquids (NGL’s) which have a much greater value than methane and so such wells are more profitable. In a typical Marcellus wet gas well today the NGL component more than doubles the value of the methane. More than half of the NGL in the Marcellus is ethane. A consequence of this shift to wet gas production will be an abundance of ethane. Ethane is very easily “cracked” to ethylene in chemical plants known as crackers. Ethylene is the raw material for a host of useful fabrics and plastics. The alternative method of synthesizing ethylene is from an oil refinery derivative naptha. 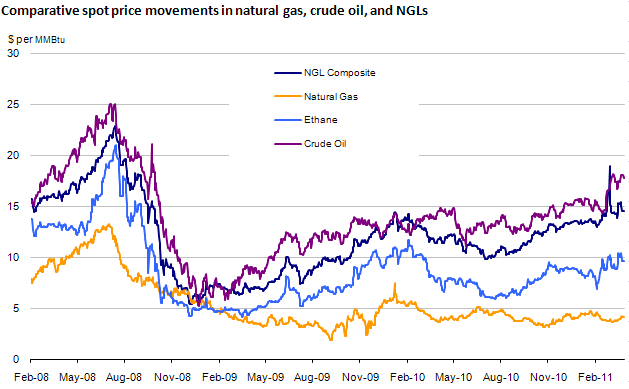 The figure shows EIA prices for all the relevant commodities. On the vertical axis is plotted the price per million BTU. This unit allows one to compare across different fluids. Clearly ethane is priced well below the NGL composite, which is close to oil. Ethylene derived from oil refining will therefore be more expensive than from cracking ethane. Much of the world’s ethylene is from oil. We could reasonably expect the US to be one of the lowest cost producers of this commodity. At the Breakfast Forum there was pushback on this point. It was suggested that demand could drive that price up. While this is generally true of most commodities, one would expect the ethane supply to stay high due to the profit potential for the gas producer. Also, from the figure we can see there is considerable head room between current prices and oil prices. NC Opportunities: Nitrogen fertilizers use methane as the feed stock. 90% of the cost of anhydrous ammonia is attributable to methane. Cheap natural gas equates to cheap fertilizer. At prices today, the raw material will cost about $100 and sell for between $600 and $800 a ton. North Carolina has the opportunity to set up plants to make this conversion, most likely in areas just west of Charlotte. A major pipeline comes in from the north in that vicinity. The area is also currently suffering high unemployment. These would be high paying jobs and lasting a long time. There was discussion regarding explosive hazard and possibility of odor in proximity to the plants. Anhydrous ammonia is not explosive but one final product ammonium nitrate is also used as an illicit explosive. The suggestion is to produce only the first product and export. Speaking of exports, if international exports are a possibility, rail lines to the coast are very accessible. Also, the value created in this conversion of methane argues against exporting LNG. Exporting ammonia makes more economic sense as we noted earlier in a post. As to odor, obviously fugitive emissions of ammonia could be an issue. But this should be a low probability event unlike the constant odor from some oil refineries. Currently we import about half of our ammonia needs. This capacity is returning to the US due to the forecasted low methane prices. North Carolina would not be an obvious site for capacity so active steps would need to be taken to secure this. Ethane cracking in North Carolina does not make a lot of sense. As noted by a discussant the ethane from the Marcellus is most likely to be shipped to the Gulf Coast because the vast majority of the capacity is there. However, we take the view it should be done close to the production and the producing states are taking steps to accomplish that. Shell has announced intent to build a cracker in one of the three states. Where North Carolina could profit is at the next level. Ethylene derivatives include a host of fabrics including polyester. The state could profit from a detailed study examining residual competencies from the previously dominant fabric industry and the bridge to the ethylene derivative fibers. North Carolina State excellence in this area should come in handy. A return to textile roots would be immensely gratifying. Cheap natural gas and associated ethane offer the opportunity for economic value creation whether or not we produce shale gas in the state. § 4 Responses to Can NC Profit from Shale Gas without producing it? It seems a pretty long stretch to talk about building ethylene derivative chamical plants in NC to feed a decimated textile business. The only cost effective implemetation of ethylene derivatives is a fully integrated up and down-stream plant. You may be right. The fertilizer argument is solid. I may be trying too hard to link to old competencies on ethylene derivatives. Anybody out there with a view? Is it feasible to import the ethylene from PA or WVa and manufacture the polyester and downstream products? The textile business is gone but are the underlying competencies still in state? I would hate to be in the business of predicting the long term price and supply of gas in order to decide about building an ethylene plant or LNG export terminal. If the price spread between the U.S. and Europe is great enough, the gas will be shipped overseas. This means there is a limit to how low the price will be here, compared to elsewhere. On the other hand, if frakking happens elsewhere, NG may become much more available and value added propositions become extremely profitable. I’m not on the air quality side. What is the time frame for getting a natural gas refining operation going? That is exactly right: there is no certainty of a price spread if shale gas is exploited elsewhere. That is why building a business on exporting LNG does not make a lot of sense as compared against producing a value added product. An LNG facility will take about 3-4 years to come on stream. The early entrant converters of gas to fertilizer will find a ready domestic market; we currently import half of our requirement. You are currently reading Can NC Profit from Shale Gas without producing it? at Research Triangle Energy Consortium.